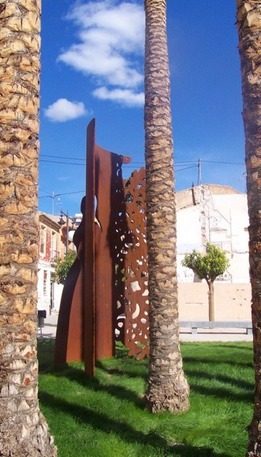 Placed on Jardinet in calle mayor, in San Vicente Raspeig, Alicante, Spain. It is a tribute to local women who had worked so hard to help the family in the past. Usually the female community worked on needlework, so the piece shows a woman silhouette and a fancywork. It is about a solid plate of steel, 40 millimeters thickness, curved and cuted by flame.